We have a good sized team today, with thirteen of us on site. I am hoping that we will make good progress despite the cold, as doing the heavy work of shovelling to clean the site will help warm people. If it were not for the cold east wind, this would be good digging weather. As it is, everyone is well padded with several layers of clothing and thermal underwear. The ditch is looking good. Even after five days’ weathering, I can’t see any trace of stratigraphy within its fill, although there is a hint that there is a difference between the top 0.4 m or so and what’s underneath. The initial clean around the edge took only ten minutes and the cleaning of the sections was complete by 11, so we had an early teabreak. It is proving very difficult to type on site, as my fingers are so cold. Who would have predicted that Easter would be as cold as this? Keeley is working on the south-west facing section of the trench, which is a slow process that means everyone else is occupied with sieving. Remarkably little is turning up from the sieves soil: a few sherds of Neolithic ceramics, the odd sherd of Roman pottery and dome dubious flints. This pretty much confirms what I observed when watching the JCB on Monday. It’s rather dispiriting for the sievers but at the moment there is nothing else to occupy people. Even the soil emptied from the ditch by the machine is more-or-less free from finds. Now that the sections are clean, it is becoming evident that the ditch contains five or more separate fills, of which the uppermost spreads out beyond it on either side. Uphill from the ditch, it becomes a separate deposit beneath colluvium (35). 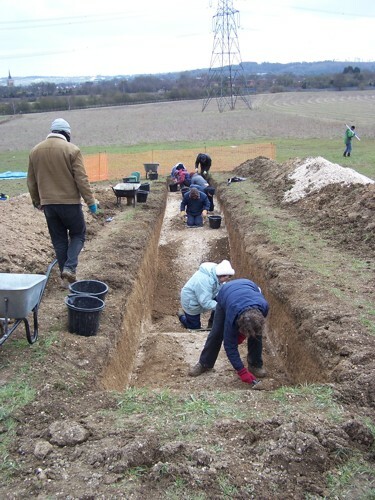 Posted on 29 March 2013, in Fieldwork, Stapleton's Field Dig 2013. Bookmark the permalink. 1 Comment. My first dig. Many thanks for a great introduction and allowing me to try all the different tasks. Really enjoyed the day. Sorry now that I have other things preventing me from returning this weekend. Hope it goes well. Will look forward to reading the blogs.